With the digital age, much has changed in terms of printing, and gone are the days of actual film and proof output. 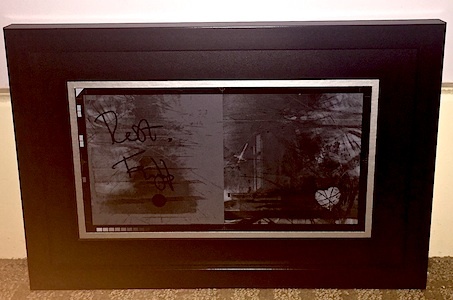 Rather than trash any of the original proofs that remain, in conjunction with Robert Fripp, we decided to instead frame them as beautiful art for the home, and simultaneously save a piece of the DGM label history. Each piece is signed by Robert, and is one of a kind. This is a match print of the cover for the original DGM sampler, Sometimes God Hides. Mounted on acid free paper behind art glass, each piece is made to stand up to the elements. Robert coined the Holy Relics term for these unique pieces which beautifully blend DGM history and art. Measures: 14 2/3" x 10".